I think we’ve all been there. That middle of the afternoon craving where you feel the tickle in your stomach telling you to eat – but it’s too soon after lunch or too early before dinner to justify eating a lot of food. What we need is something that gives us just enough to give us that pick-me-up without spoiling our appetites. The new Ritz Crackerfuls aim to do just that. Ritz Crackerfuls Multigrain is a great pick me up snack between meals – help curb hunger with real food! Crackerfuls is the delicious snack that fills you up in the afternoon and helps keep you satisfied until your next meal. 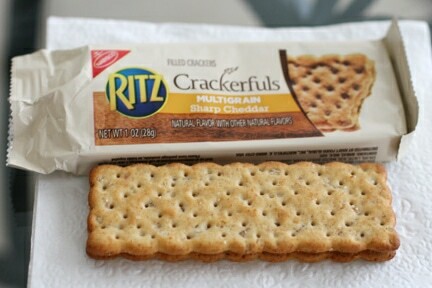 This afternoon, I felt that oh-so-familiar between-meal hunger twinge and broke open the box of Ritz Crackerfuls. Each cracker is a sizeable 1.5″ x 4.25″ (approximately) of multi-grain goodness. Sandwiched between each cracker is a layer of sharp cheddar cheese. The crackers have a great texture and crunchiness to them. They’re sturdy and dense crackers, not like crackers that are flaky and seem puffed with air. The cheese is smooth and has a definite sharp cheddar flavor. I was somewhat surprised at how much flavor the crackers had – they would even taste good by themselves. After eating the whole Ritz Crackerfuls cracker sandwich, my stomach was content, as was I. One thing I really like about the Crackerfuls Multi Grain Sharp Cheddar is the amount of fiber per serving. Each cracker sandwich has 5g of dietary fiber in just 130 calories. 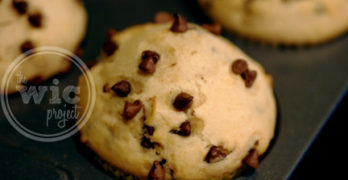 They’re also made with real cheese and have 8g whole grain. In addition, portion control is a breeze – one cracker sandwich per package, so you don’t have to worry about grabbing handfuls of crackers repeatedly. There are six individually wrapped cracker sandwiches per box. 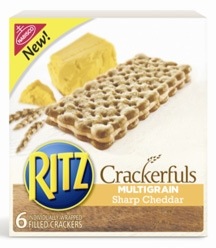 If you like cheese and crackers or looking for a healthy way to fight between-meal hunger, check out Ritz Crackerfuls. They’re like the adult version of the cracker sandwiches we ate when we were young, only bigger and much healthier. 🙂 Make sure you visit Ritz Crackerfuls on Facebook to download a coupon for $0.75 off any variety of Ritz Crackerfuls. What are some of your favorite afternoon snacks? 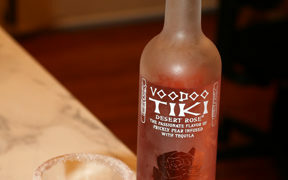 Disclaimer: This post consists of my (and/or fellow tester) opinions only. Your experiences may be different. No compensation was given for this review/giveaway.I did receive a free product as part of my association with One2One Network to use and test for the purposes of this review. This did not affect the outcome of this review.